This post explores a marketing tactic submitted by Edina Realty Home Services, the most recent winner of #madREskillz, a weekly Inman News Twitter conversation. Every Thursday, Inman News invites real estate professionals and companies to tweet offbeat marketing tricks using the tag #madREskillz. After reviewing the submissions (and “RTing” many in the process), we select two finalists and put them to a vote on Facebook. Then we feature the winner in a story. “Mobile, mobile, mobile” is something of an industry refrain today. And though you may be tired of hearing it, it’s unlikely to fade anytime soon: The number of buyers who lean on smart devices to hunt down homes continues to increase rapidly. Seeking to capitalize on the trend, some brokers are developing applications that not only make it easier for consumers to visit and search homes on the fly but also present a way for agents to cultivate relationships with clients and scoop up leads. Edina Realty HomeServices recently claimed the #madREskillz mantle for developing a trifecta of such apps for iPhone, iPad and Android. Julie Weil, director of digital strategy at Edina Realty, said the brokerage decided to develop the new apps, which replaced older apps created by a different vendor, in response to skyrocketing demand from consumers. Obtaining listings through an Internet Data Exchange (IDX) feed from the local multiple listing service, the apps purportedly provide more up-to-date property data than apps offered by third-party listing sites like Zillow and Trulia, whose listings come from many sources and have come under fire for data inaccuracy. In addition to allowing a buyer to search listings based on traditional criteria, Edina Realty also allows a consumer to use a GPS locator to identify for-sale properties close to the consumer’s location, according to Bob Peltier, the brokerage’s president and CEO. 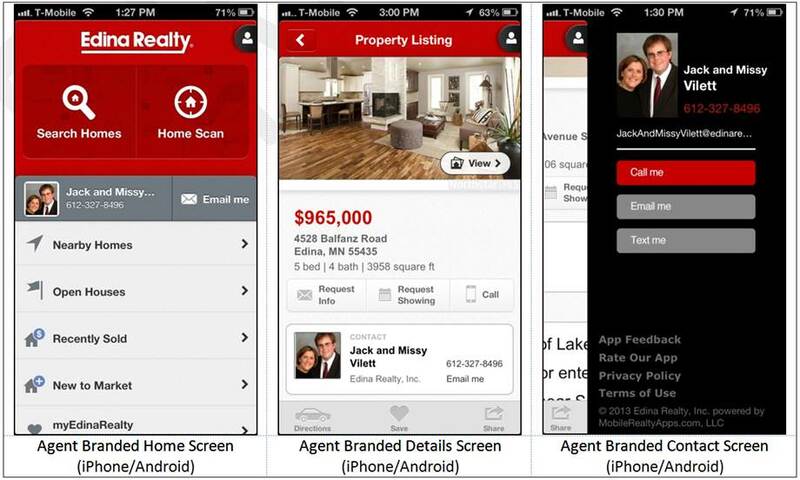 The apps also directly benefit Edina Realty’s agents by offering “sub-branded” versions that integrate an agent’s identity into the apps and encourage a consumer to connect with that agent. In several of the sub-branded versions’ pages, an agent’s photo and contact information are prominently displayed. Consumers may call, email or text a question or request a property showing, all from within the app. Users also may hone in on open houses near them; get driving directions to homes; save their favorite properties for sale in their MyEdinaRealty account; and visit those properties again through the apps (company-branded or sub-branded) or on the brokerage’s desktop site. Despite the impressive features, branded apps may not offer enough return on investment for some brokerages. “While we do work with some small firms of under 25 agents, we primarily work with and have found our solutions are most cost-effective for firms with 100 or more agents,” said MobileRealtyApps President Aaron Kardell, whose company helped develop Edina Realty’s apps. Edina Realty would not tell Inman News how much money it spent to build its apps, and Kardell declined to provide pricing data for its services. 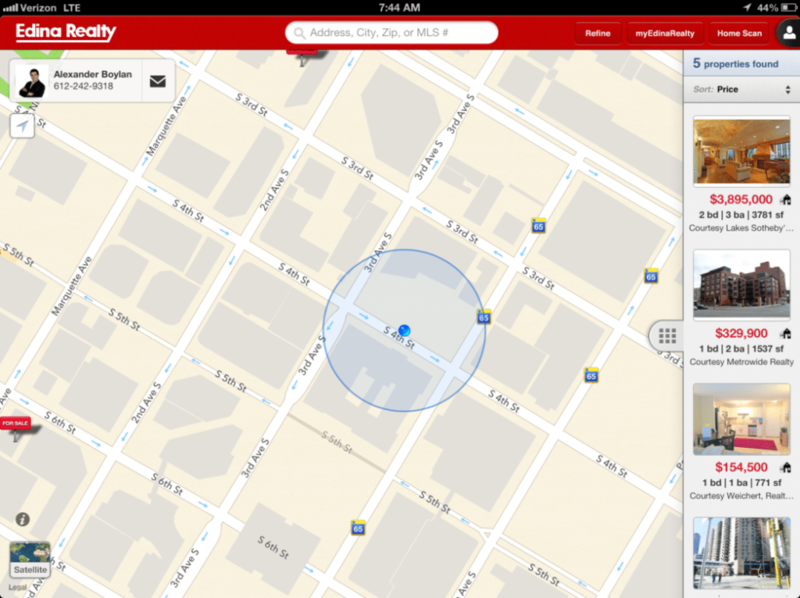 Edina Realty’s apps took 10 months to build, according to the brokerage, but they appear to include many of MobileRealtyApps’ advanced features. For some smaller firms that haven’t asked for many of those features, MobileRealtyApps has built them apps in 30 to 60 days. Do you think branded apps are worth the investment?